With the first model of the MEGAfume family, Attestor Forensics presents an all new range of cyanoacrylate fuming chambers for the development of latent fingerprints on non-porous surfaces. Initially available as the large bench top model MEGAfume M60, the series shall be complemented by smaller but also larger variants. All models within the MEGAfume series will draw on the same innovative design details, which take account of the increasing focus on standardisation, quality monitoring and especially DNA safety. The construction features an exoskeleton which allows the surfaces of the inside walls to be made completely from plane safety glass. An internal mechanical structure is not required. Grills and hanging rods are made from high quality stainless steel, resisting also the DNA decontamination with corrosive cleaning agents. All of this, including the supports for grills and rods, the water reservoir for the humidifier as well as the circulation fan and the air guiding baffle can be completely removed from the cabinet without the need of tools. This makes cleaning and DNA decontamination outstandingly easy. The entire development of latent prints from humidification to the final removal of fume remains from the air inside the cabinet can whether be activated fully automatic or manual. Several pre-programmable cycles allow setting the parameters for various development chemicals or evidence type. This allows standardised, quality and performance monitored variations in the development but yet by one-button-operation. An capsuled, dust-free activated filter cartridge filters the air inside after fuming. A novel filter management system, considering amount and type of chemical ensures efficient and safe utilisation of the full filter capacity. A multilingual colour touch panel display guides the user through the process via graphical and clear text messages and even assist routine service tasks like filter replacement by pictured and interactive guidelines. MEGAfume also features a process protocol system which continuously logs all development parameters in a traceable way for quality documentation. A range of further design features complement the innovative concept. Innovative Interior Concept All inner side walls are made from even, frame and seamless safety glass panels. The support rails on the side can be used with sturdy grills or freely distributable hanging and support rods (all made from stainless steel). Grills, rods and supports can be completely removed for easy cleaning. liquid or in powder form, fluorescent or non-fluorescent) care for ease of use and consistent quality of print development. Parameters and timer can be adjusted by the user to his particular best practice rules. Alternatively the entire process can be controlled manually. Electro-mechanical door interlock The large glass front door, which allows easy loading of the cabinet, is interlocked by the control system during the development process via an electro-mechanical locking mechanism. In combination with a high performance silicon seal this ensures secure and low maintenance closure of the cabinet. 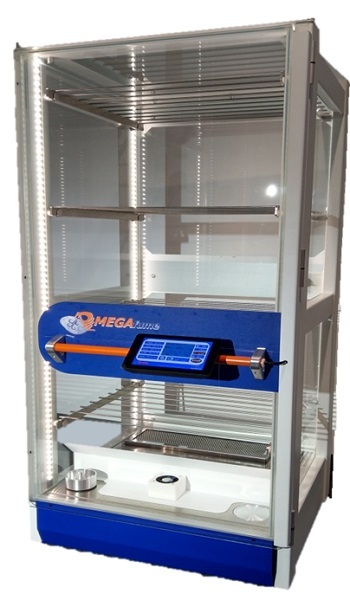 UV Decontamination Unit (optional) In addition to the easy cleanable surfaces an optionally available UV-C unit allows breaking up the DNA chains on interior surfaces to reduce the risk of crosscontamination. Low cost of ownership and minimal waste Low cost carbon activated filters which are simple to replace. Touch panel control Multi-lingual operator guidance and touch panel control for humidty, temperature and cycle time.